The 80-year-old City Light Hotel in Secunderabad crashed down about 6:30 a.m., according to reports. At least 18 people were reported injured. What caused the 80-year-old City Light Hotel to come crashing down Monday (July 8) was unknown Tuesday afternoon. Officials are investigating. Officials told reporters Tuesday that one more person may still be trapped in the debris. Rescuers pulled a male survivor from the rubble after 18 hours, a New Delhi television news outlet (NDTV) reported. Witnesses said the building came down “suddenly with a loud sound coupled with cries of people,” reports ibnlive.in.com. Since the collapse, many survivors have come forth with their terrifying accounts, reports the Deccan Chronicle. C. Nagesh, a 28-year-old wheat delivery man, said he was at the hotel’s front counter checking accounts when he took a phone call and stepped outside. “There was no sign of the laborers who had been unloading the [wheat] bags. All who had entered the hotel were smashed. For more than 10 minutes, I didn’t understand what to do,” he said. The hotel, owned by Syed Hasan Ali, had been a popular landmark in the area. 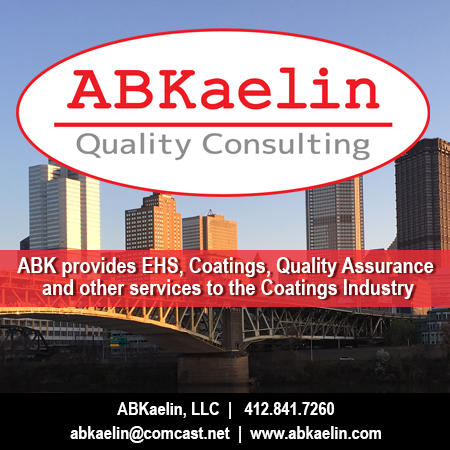 The cause of the collapse had not yet been identified Tuesday afternoon, but an investigation was underway. 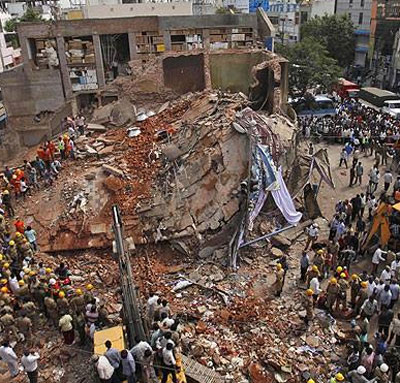 Bhupathi Vikram Deva Raju, a spokesman for Hyderabad's police commissioner, initially told reporters that the building may have fallen because it was old. A garment factory collapsed in Bangladesh in April, killing more than 1,100. However, NDTV reported Tuesday that civic authorities have blamed the building owner, saying that the weight of “bricks being transported to the first floor for installing ovens” contributed to the collapse. “Despite the structural weaknesses in the building, City Lights was not among the buildings in the city that were recently issued notices on safety,” the news bureau said. Many locals claimed that the structure was unsafe, while others indicated the building was in reasonably stable condition, reports said. Monday’s collapse follows a series of tragic collapses on the Indian Subcontinent. 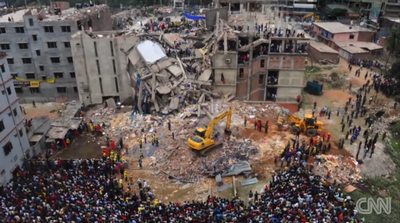 In April, a garment factory complex in Bangladesh collapsed, killing more than 1,100 people. Also in April, a residential building collapsed in Thane, killing 74 people, including children.